Poor magic users. In the world of the Dragon Age video games, they’re relentlessly persecuted because of their talents, to the point of captivity or even death. Now the latest Dragon Age comic is basically all about Mages being hunted down and killed. They can never catch a break, these mages! Dragon Age: Magekiller is Dark Horse Comics’ latest foray into Bioware’s fantasy world for comics, off the back of a trio of short-running series. Written by Greg Rucka with art from Carmen Carnero, Magekiller will tell a story that runs concurrently with the story of the most recent Dragon Age game, Inquisition—telling the story of two mercenaries from the pro-magic region of Tevinter who spend their life hunting down practitioners of dark blood magic for fun and profit. Well, I guess not for fun, but for profit certainly. There’s probably not much fun going up against someone who can mess you up with evil magic when all you’ve got is a particularly pointy sword and a Job contract. Still, Magekiller looks like it could deal with some pretty interesting things for Dragon Age fans that the games haven’t really delved into—the land of Tevinter is still largely unexplored in the series, and a series about combating mages-gone-bad rather than Dragon Age’s usual moral debates over the rights of magic users sounds like it could be a lot of fun. 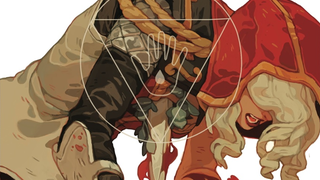 And judging by Sachin Teng’s beautiful cover art, rather bloody as well. Dragon Age: Magekiller will begin in December.